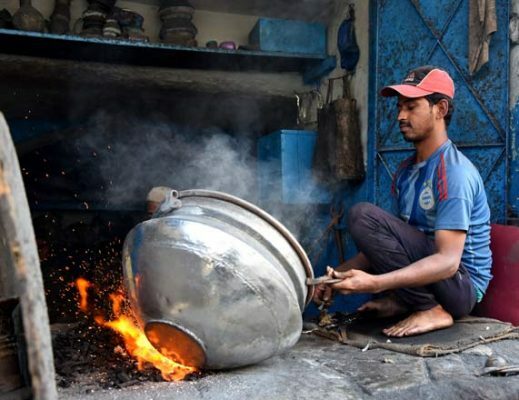 Hyderabad: In a nondescript shop in Mahboob Chowk in the Old City, Shaik Tajuddin picks up a huge tarnished cauldron and pours cleaning acid into it. The next minute, he applies a coat of thin Malaysian tin foil on the vessel. Undeterred by the sweltering heat in the room, Tajuddin takes a thick pad of cotton, soaks it in ‘nausadar’ (ammonium chloride) ash, and rubs it inside the utensil. In a few minutes, the tarnished, blackened cauldron that he had started working on disappears, literally, and in place of it, there is a shining one, as good as new. The vocation undertaken by Tajuddin is called ‘qalai’ and the persons who do it are known as the ‘qalaigar’. Only a handful of people are now into the vocation. Basically, the work is done on copper and brass utensils, mostly old ones, to give them a shiny and new look. A handful of shops along the Mahboob Chowk Road in the Old City are those that are still into the vocation. “It is a tough job. Now only a few families are doing it. Only those who have learnt from their forefathers are into it. Outsiders are scared of handling acid and working with burning coal and fire,” says Tajuddin. Generally, people have a tradition of keeping brass and copper utensils at home and sometimes make wedding presents out of those. So the utensils keep coming for polishing every five or six years. There is also demand for polishing newly made ones from shopkeepers too. “Hoteliers often send big cauldrons as they regularly use it to cook food. To ensure that cooking utensils do not get rusted due to regular washing, they need to get it cleaned and polished,” says Nayeem, another ‘qalaigar’. Most of the orders come from hotels and with eateries thriving, we have some business, he adds. 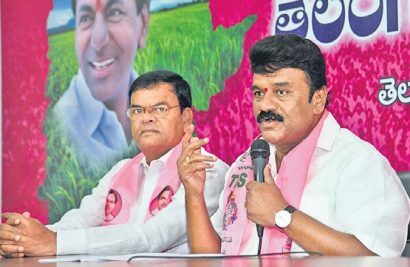 Nayeem says they charge a minimum of Rs.50 and a maximum of Rs.1,000 for a work. “Prices depend on the size of the utensil. Recently we hiked the rates due to increase in prices of material used by us for doing the work. Prices of charcoal, Malaysian foil, acid and other things have shot up. We are left with very little money in the end,” he adds. The work is quite strenuous, which is perhaps why the younger generation hasn’t shown much interest, the old-timers feel. “One needs to work in fire, heat and fumes for at least eight to ten hours a day. Many prefer small businesses or driving an auto-rickshaw or cab over ‘qalai’ work. Our children are not different. They are looking for comfort,” says Yousuf, who runs his shop from the Jamia Masjid Chowk.